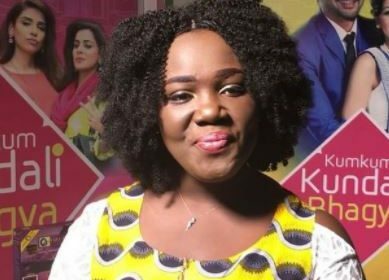 Television Presenter and host of the ‘KumKum Bhagya’ show, Cynthia Tima Yeboah of Adom TV has been robbed at gunpoint. The incident happened at about 11:30 pm when she was returning home from work in the company of her driver. Narrating the incident to Adomonline.com, the visibly distraught Cynthia said she came face-to-face with the robbers at New Bortianor, a suburb of Accra, after a U-turn near the West Hills Mall. Explaining the circumstances surrounding the attack, Cynthia said she stepped out of her car to assist a supposedly helpless person lying on the floor. She added that one of the two people who attacked her was lying on the floor whilst the other was by the road requesting for help. Cynthia had to give a sum of GH? 1,200.00 to the robbers after the one lying on the floor pointed a gun at her and requested for her valuables. She told Adomonline.com that, she had, prior to the incident, asked her driver to ignore the ‘helpless’ man because her instincts told her something wasn’t right. But the driver asked that they help because he suspected the man might be in trouble. She said the robbers bolted with the cash after they saw a police patrol team approaching the scene. Cynthia has since reported the case to the Police.